2018 saw my tastes begin to shift. The power metal that brought me to the dance — while still producing some gems for the year — had to watch as blackened death metal swept me off my feet and took me home once the music had stopped. A full half of my top ten for the year — and all of my top four — could have been tagged (arguably) with both “black” and “death.” While I enjoy albums of each genre on their own, there’s something about the two being combined in interesting ways that really gets my juices flowing (this is your cue to don eye protection). 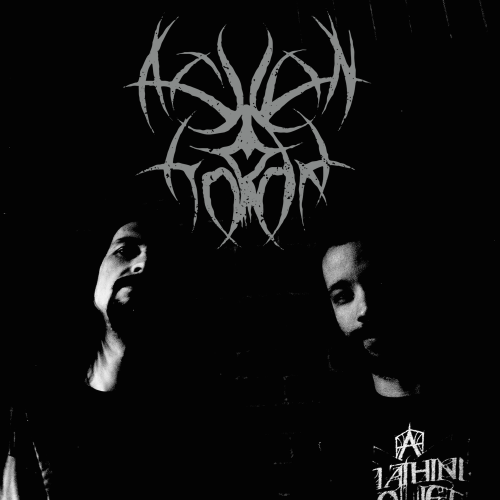 Hence, my interest in Los Angeles’ Ashen Horde, the proggy black/death project of multi-instrumentalist Trevor Portz and Inferi / Equipoise vocalist Steve Boiser. Might the band’s third full-length Fallen Cathedrals allow them to join Wachenfeldt and Musmahhu in my pantheon of blackened death greatness for 2019? In short, yes. Boiser is becoming somewhat of a darling around AMG, with two of his other projects receiving high marks here recently, and Fallen Cathedrals is no different. His gnarly shrieks and thundering growls fit perfectly for a black/death combo, and Portz has dialed up an amazingly varied set of energetic technical and progressive songs. While difficult to nail down, the style here could be described as a combo of Enslaved, Ihsahn, Inferi, and all of Devin Townsend’s differing projects, and this strange brew is used to tell a dystopian tale of the devolution of mankind. While I’m excited to see the lyrics to truly follow along, the music and Boiser’s delivery allowed me to catch a lot of the concept’s plot. Boiser’s performance here, coupled with Inferi’s twisted take on Dante’s Inferno from last year, is leading me to consider him to be one of extreme metal’s best storytellers. First single “Profound Darkness” is a decent example of what Fallen Cathedrals has in store. It starts with a proggy intro motif, moves into a tasty verse riff accompanied by blackened rasps, and then reveals a chorus with clean vocals. Boiser’s singing reminds me of Devin Townsend’s higher cleans, and juxtaposed with some layered screams and growls like they are here, they sound amazing. The song blasts into some tech death/black before exiting the same way it came in. The black metal gets dialed up on “Retaliation – Regret” with some impossibly fast tremolos, “Final Ascent” brings some Slugdge-style prog death complete with instrumental jam, and “Cages” features an uplifting melody and a large helping of the clean vocals. It’s amazing how each song here includes all of the same stylistic elements, but each one has its own character. Penultimate track “Face of the Enmity” is a seven minute killer. It features some amazing riffs, an emotional solo, insane vocals, and contains the story’s climax. It’s an early contender for my song of the year. Don’t be deceived by the presence of clean vocals and some progressive meandering, because Fallen Cathredrals is br00tal AF, a fact that’s made apparent in the album’s first minute. Portz’s compositions and Boiser’s delivery actually had me thinking of the chaotic genius of Anaal Nathrakh or Strapping Young Lad at times. Initially, the vocals seemed to be a bit back in the mix, but after repeated listens I learned to love everything about the production. I have thoroughly enjoyed my time with the album and have very little in the way of criticism. 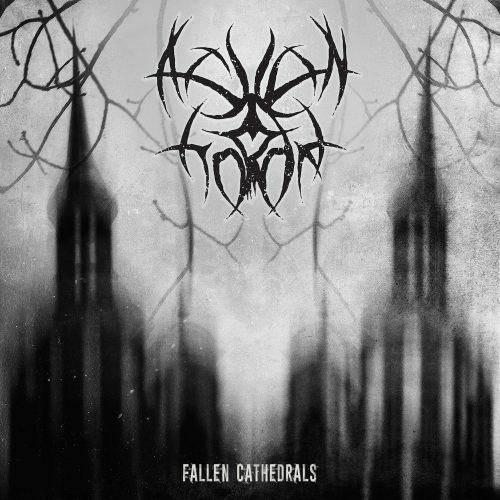 At first, I thought that Ashen Horde had bitten off more than they could chew with the amount of sounds and ideas on Fallen Cathedrals, but after a dozen spins, nearly every note serves to expertly drive the album and story forward. Portz has crafted an album that’s simultaneously brutal and catchy, and Boiser has provided his strongest and most varied performance that I’ve heard to date. I can’t recommend this enough for fans of black and death metals being combined in unique ways.